As usual, this project was started months ago. But, it’s simple and easy. Definitely something you could do in your own home. 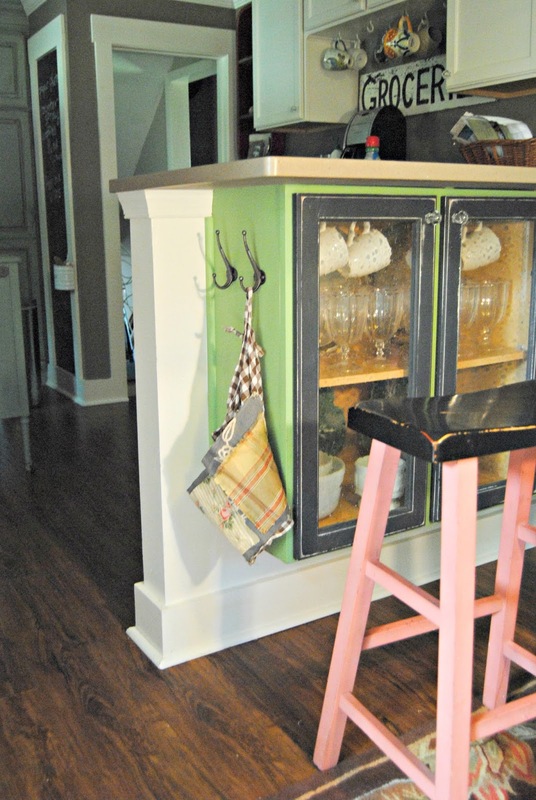 Remember my kitchen? There’s a little about it here, here, and here. 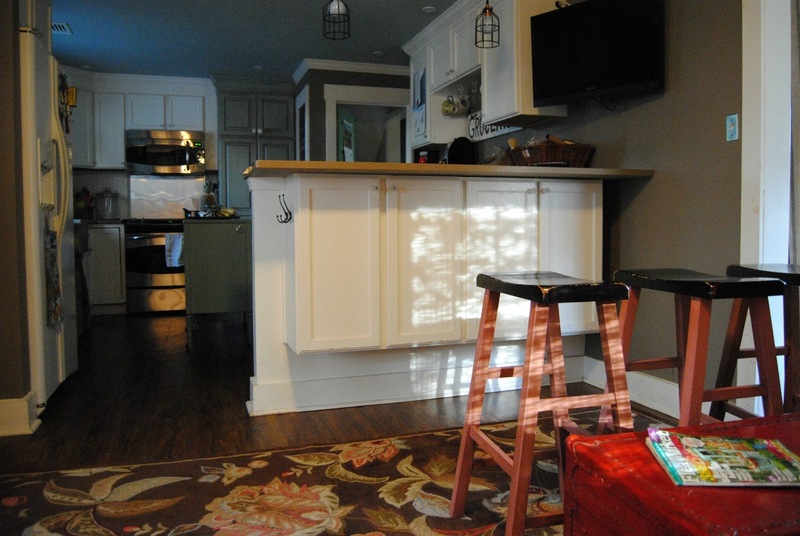 We took down a wall between the kitchen and dining room to create one larger room. We also created a peninsula because of this wall removal, and, I got to add some storage cabinets on the back side of the peninsula. Okay, so all that is not the “simple and easy” part. 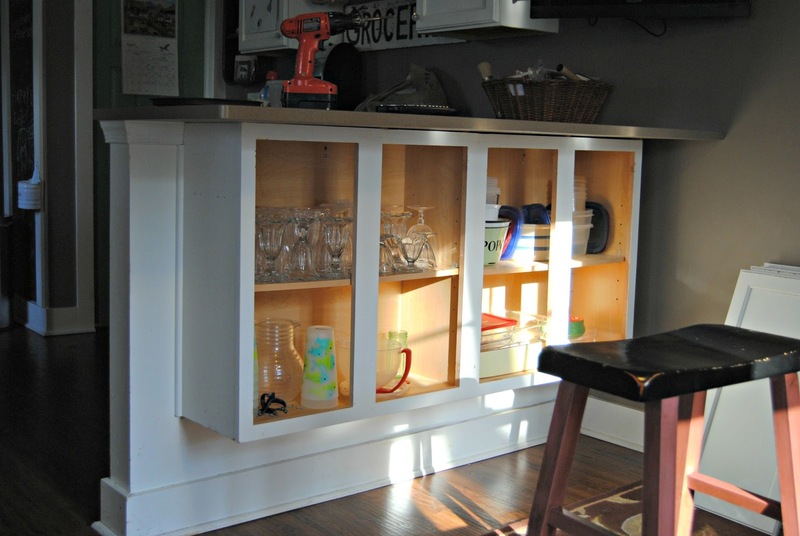 I’ve always wanted to do something more with those storage cabinets. So, I removed the doors and got to work on them. 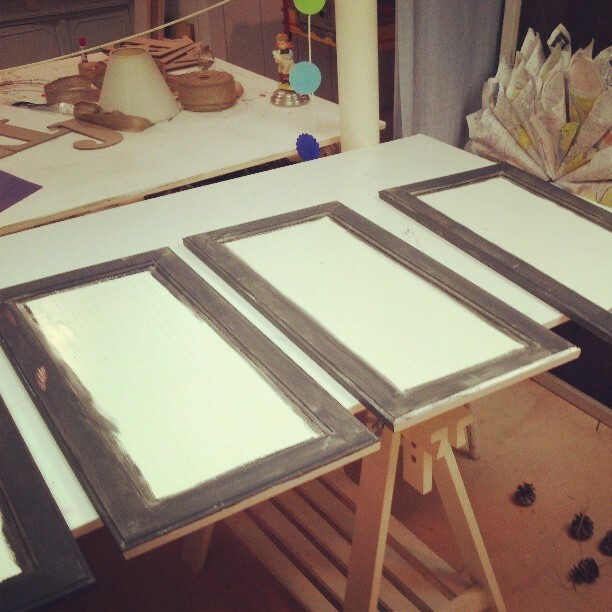 I painted the edges of the door Annie Sloan Graphite, and had my nephew cut out the main panel of the door, so that I could add glass panels. 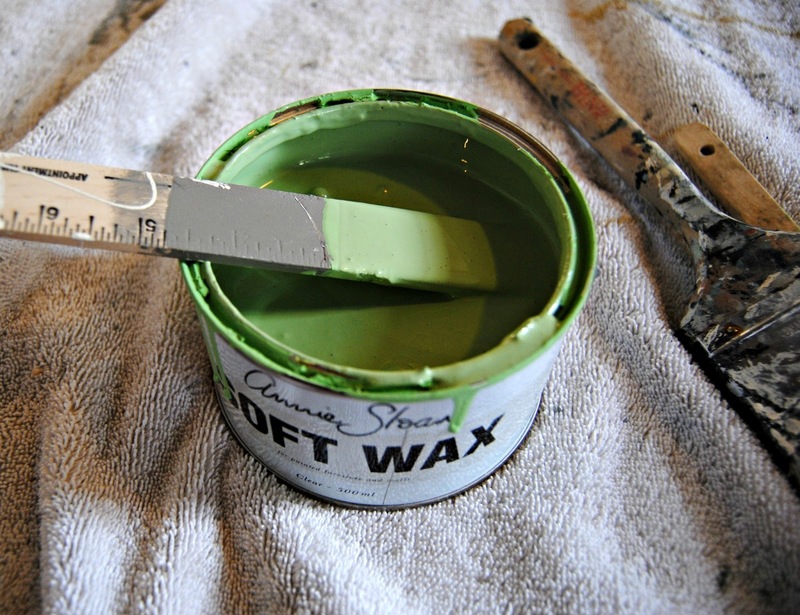 Using left over AS paints, I created my own shade of green. 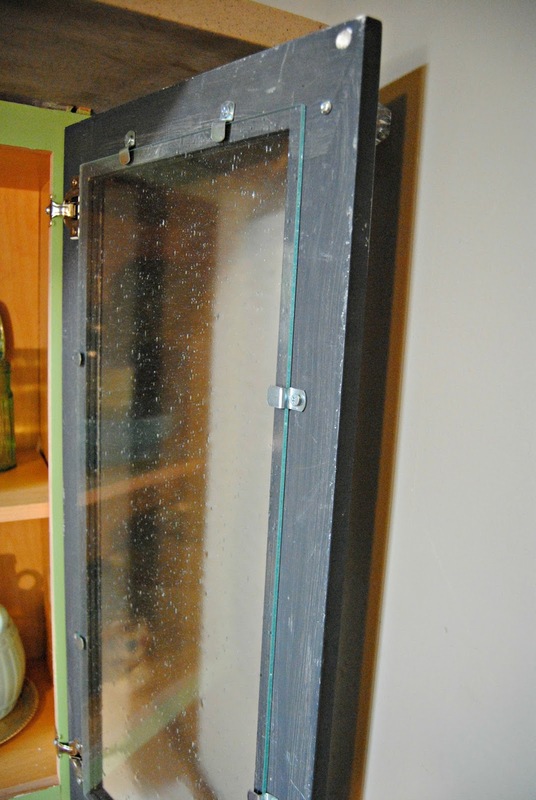 I had the local glass store cut seeded glass to fit (about and inch larger) the opening in the cabinet door. 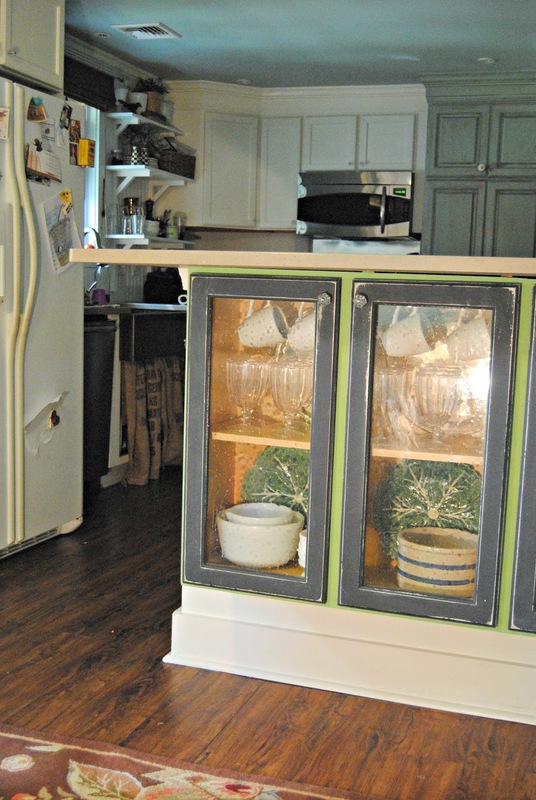 I didn’t paint the inside of the cabinets, may be in 2015. 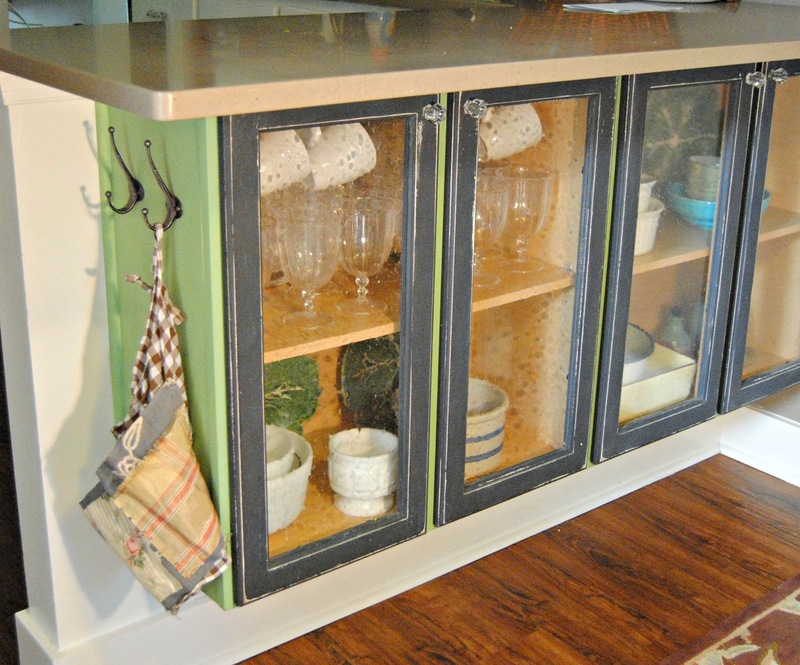 So, I used green leaf plates and silver plates to line the back of the cabinets and give it a little extra punch. 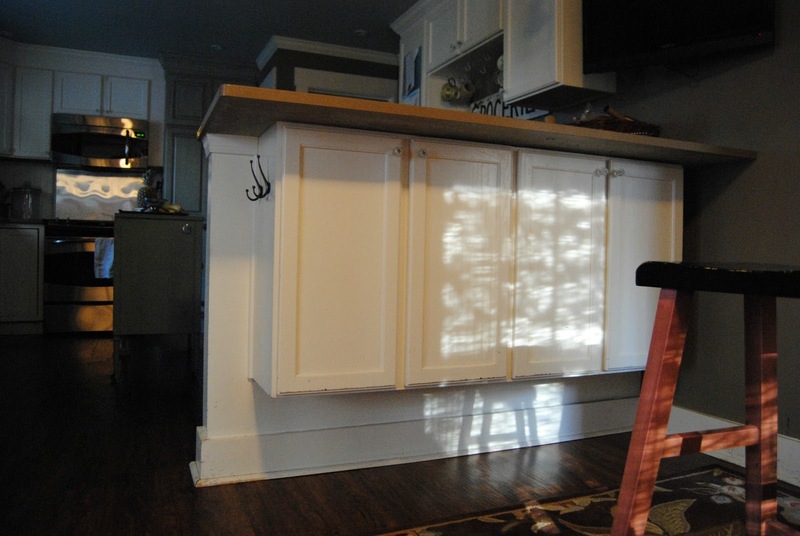 I used cup hooks along the top of the cabinets so I had a little more strorage room while still keepin’ it pretty. 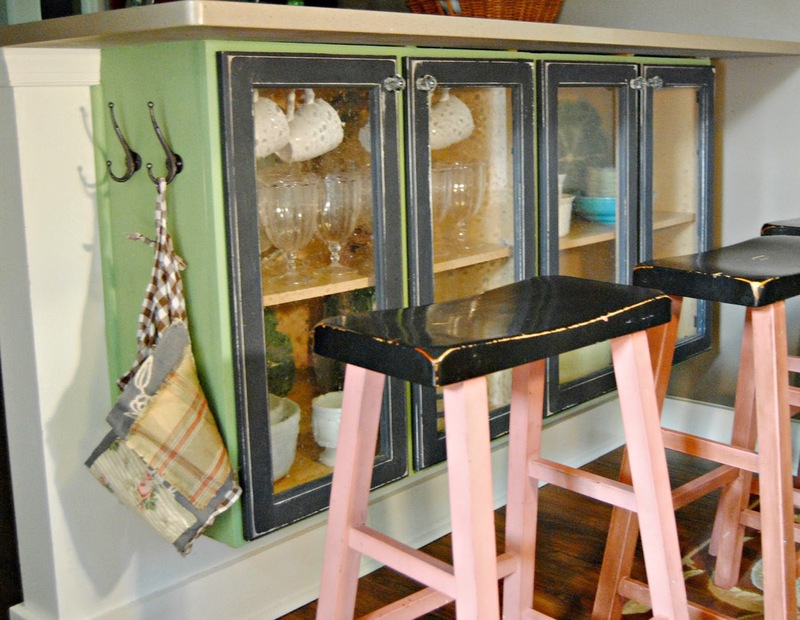 Now, if only I could figure out what color I want to paint the stools. Great job! Looks like it's always been that way all along! I'm with Camille on this one. Would never work at my house. 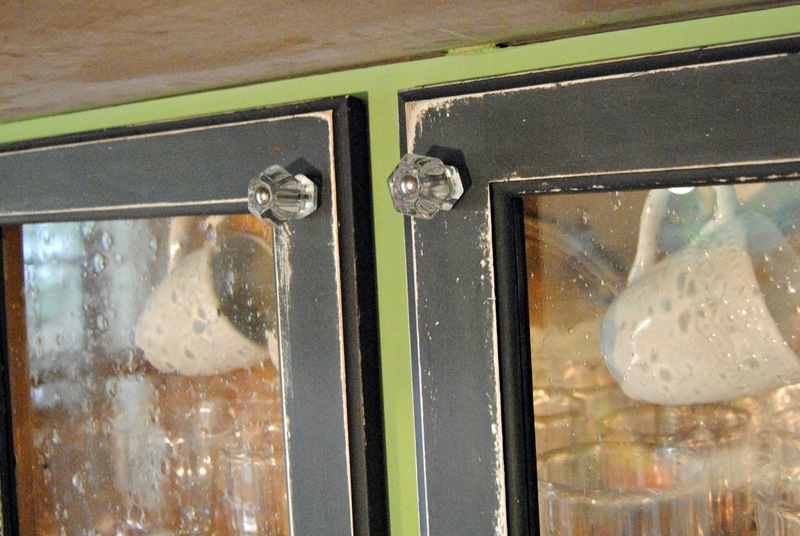 I've had my Great-Grandmother's china hutch 'dinked' a few times since acquiring it from my Dad. I cringe every time I hear that sound…so far…nothing has gone through it. *your kids are bigger, but accidents happen. (the whole reason I painted my kitchen floor this weekend) LOL! 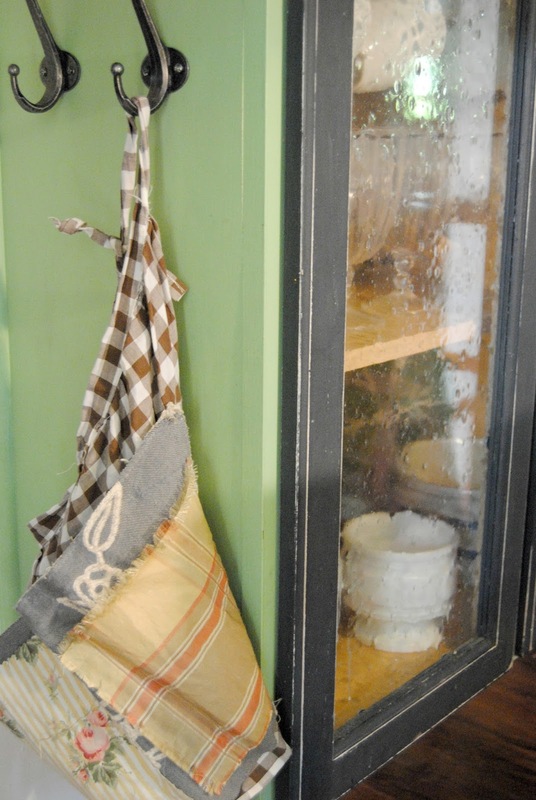 I must say.. .I do love the seeded glass panels. may go that route if I ever have to replace the glass I have. I DO LIKE THAT COLOR OF GREEN TOO!!! 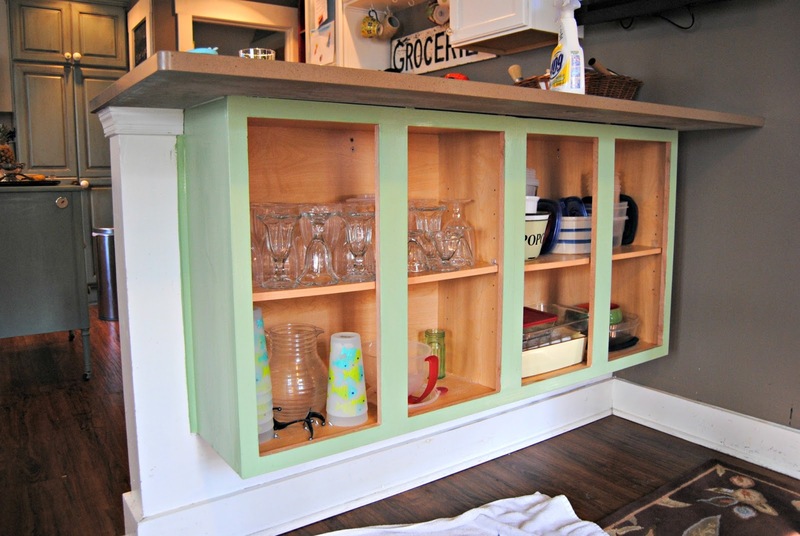 This is such a nice blog and It is really helpful for me, But i am looking for the kitchen cabinets related post,So please suggest and share if you have. 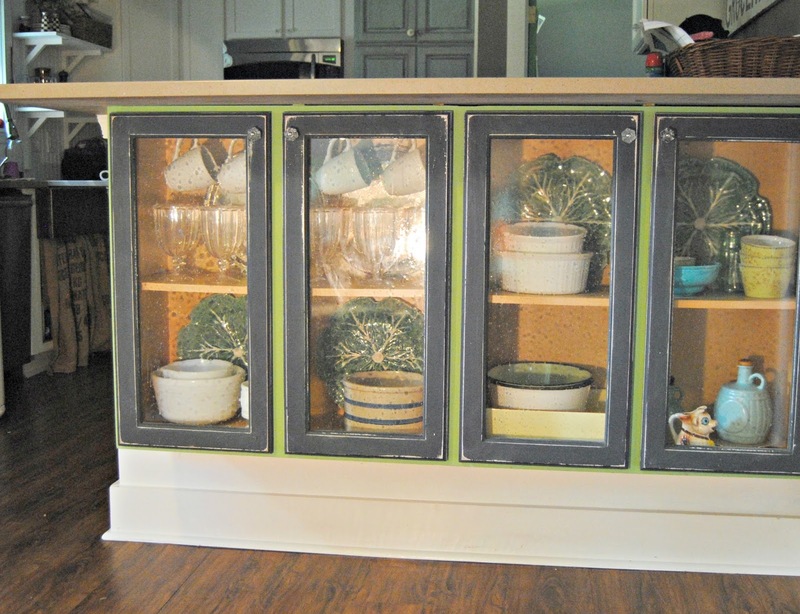 These glass door cabinets look beautiful. 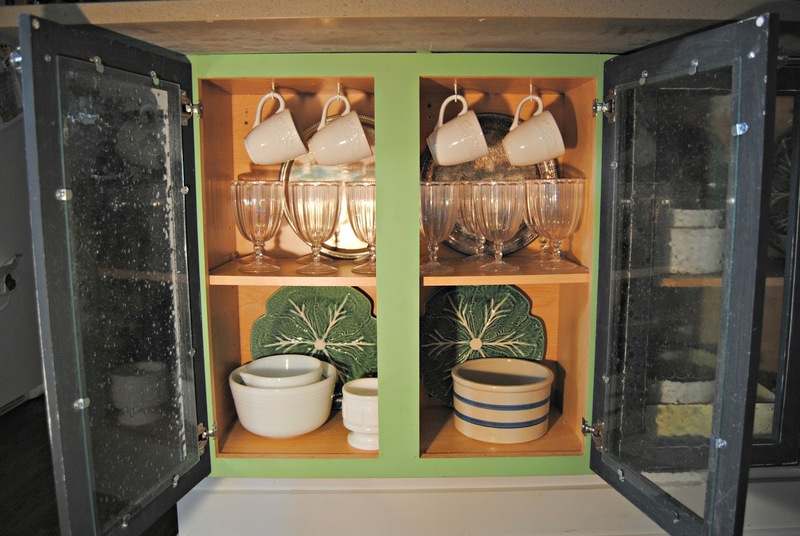 I also have cabinets but I don't add glasses like this. 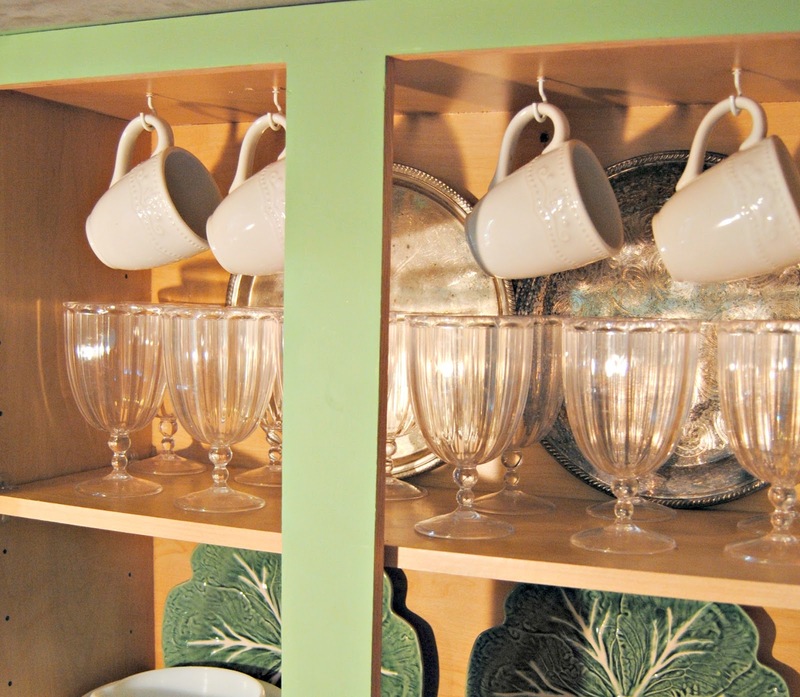 But I found this idea creative so I think to replace my doors with these glasses.